Much of what you need to know for electrical repairs and remodeling involves wiring—how to identify it, how to buy it, and how to install it with proper connections. If you're planning any electrical project, learning the basics of wiring materials and installation is the best place to start. Understanding basic wiring terminology and identifying the most common types of wire and cable will help when investigating wiring problems and when choosing wiring for new installation and remodeling projects. To learn everything you need to know, refer to the article links referenced here. The proper wire size is critical to any electrical wire installation. Wire sizing indicates the diameter of the metal conductor of the wire and is based on the American Wire Gauge (AWG) system. The gauge of a wire relates to the wire's current-carrying capacity, or how much amperage the wire can safely handle. When choosing the right size of wire, you must consider the gauge of the wire, the wire capacity, and what the wire will be used for. Wires that are not properly matched to the amperage of the circuits they serve can create a notable risk of short circuit and fire. Most interior wiring is done with non-metallic, or NM, cable—also known by the popular brand name "Romex." NM cable is made of three or more wires wrapped inside a flexible plastic jacket, or sheathing. It is used for most interior circuits, such as those for outlets, switches, light fixtures, and appliances. 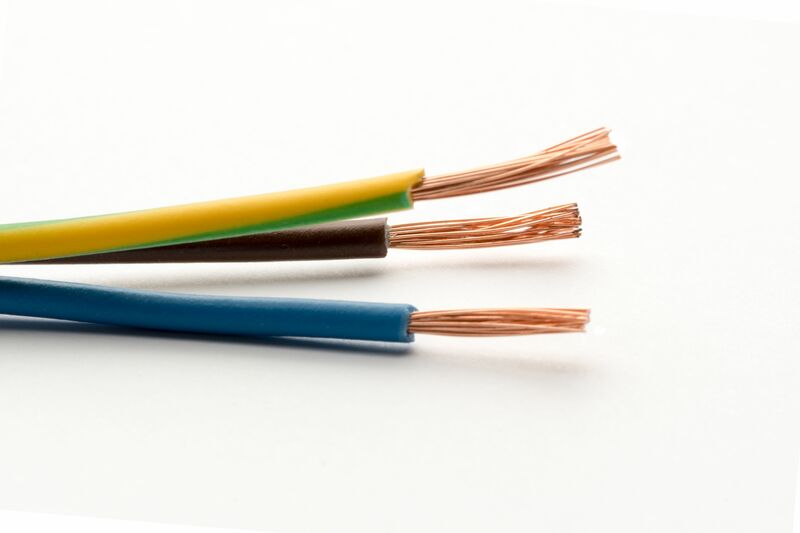 Learn the basics of NM cable to choose the right type for your next electrical project. Color-coding is used both on the outer sheathing of bundled electrical cables, and also on the individual conduction wires within cables or inside conduit. Understanding this color coding can help you identify what the wiring is used for and helps maintain consistency within an electrical system. Cable coloring relates to the size of the wires inside the cable and the cable's amperage rating. For example, white-sheathed NM cable is used for 15-amp circuits, while yellow NM cable is rated for 20-amp circuits. The coloring on individual conducting wires usually does not indicate a size or rating but rather the standard or preferred use of the wire. For example, black and red wires typically are used for current-carrying, or "hot" connections, and white wires usually are grounded "neutral" conductors. Green-insulated wires, and bare copper wires, are used for grounding wires. Electrical wires and cable have markings stamped or printed on their insulation or outer sheathing. These markings provide important information about the wiring and insulation, including the wire size and material, the type of insulation, the number of wires contained (inside a cable), and any special ratings or characteristics of the wire. While looking at the color of wire or cable will help you narrow down the options at the store, reading and understanding the labels on wiring is the best way to ensure you get the properly rated material for your project. Standard electrical cable is designed to be run indoors, where it stays dry and is protected by wall, ceiling, or floor structures. For outdoor projects or when running wiring underground, you must use direct burial cable, which can be installed underground with or without conduit (depending on local building code rules). With direct burial cable, the individual conducting wires are embedded in solid vinyl to fully protect them from moisture. Stripping electrical wire involves removing the plastic insulation surrounding the wire's metal core. It's important to do this carefully so there is no damage to the metal. The procedure is simple but requires a special wire stripping tool and an understanding of how to use it. This is a critical skill—and tool—for DIYers to have for any wiring project. When running individual electrical wires inside conduit, there is a limit to how many wires are allowed. The maximum allowable number is known as the " fill capacity," and this depends on several factors, including the size of the conduit, the gauge of the wires, and the conduit material. Metal (EMT), plastic (PVC), and flexible conduit all have different fill capacities, even when they're nominally the same size. The electrical panel, or service panel, is the power distribution point of a home electrical system. This is where all of the individual circuits of the house get their power, and where they are protected by breakers or fuses. Wiring an electrical panel is a job for a licensed electrician, but DIYers should have a basic understanding of how a panel works and the critical role that breakers play in any system. An electrical disconnect provides a means to shut off the power to a home's electrical system from an outdoor location. It is typically mounted below the electric meter, either on the side of a home or on the utility company's power pole. Not all homes have a dedicated disconnect. They are commonly used when the service panel (which also serves as a main disconnect) is located indoors and therefore is not accessible to emergency responders or utility workers. Like electrical service panels, a disconnect must be installed by a licensed electrician.